Mobile Substrate Officially Updated To Work On iOS 4.2.1 - iPhone.MY - Daily News On Mac, iPhone, iPads, iPods and more! 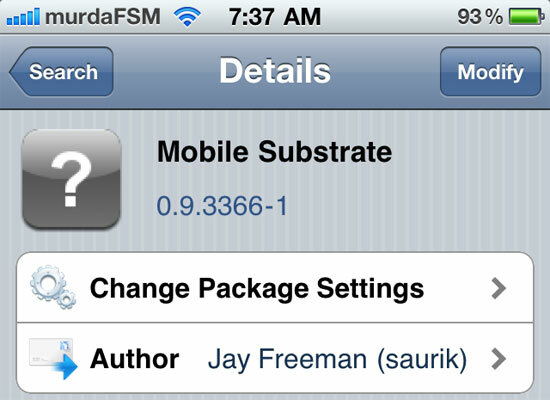 New day, new update in Cydia: Mobile Substrate. If you are not familiar with it, Mobile Substrate is a support framework, used by iOS projects such as WinterBoard, Five Icon Dock and ultrasn0w. Unfortunately most mobile substrate extension won’t work on iOS 4.2. You will need to wait for devs to update their stuff, and most of them will do so by the time a new jailbreak will be released. There are a few unofficial ways to jailbreak your iOS devices on iOS 4.2 at the moment, but we don’t recommend you to use them. Just be patient….